Polar cod (Boreogadus saida) and saffron cod (Eleginus gracilis) are key fishes in the Arctic marine ecosystem, serving as important trophic links between plankton and apex predators, yet our understanding of their life histories in Alaska’s Arctic is extremely limited. 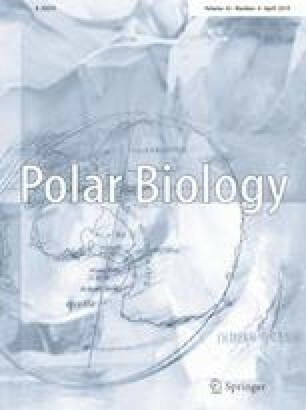 To improve our knowledge about their early life stages (ELS), we described the spatial and temporal distributions of preflexion larvae to late juveniles (to 65 mm in length) in the Chukchi and western Beaufort seas based on surveys conducted between 2004 and 2013, and examined how their abundances varied in response to environmental factors. Species-specific differences in habitat use were found, with polar cod having a more offshore and northern distribution than saffron cod, which were found closer inshore and farther south. Polar cod preflexion and flexion larvae were encountered throughout the sampling season across much of the shelf, which suggests that spawning occurs over several months and at multiple locations, with Barrow Canyon potentially serving as an important spawning and/or retention area. Polar cod ELS were abundant at intermediate temperatures (5.0–6.0 °C), while saffron cod were most abundant at the highest temperatures, which suggests that saffron cod may benefit from a warming Arctic, while polar cod may be adversely affected. This research provides new insights into how environmental variability influences the distribution and abundance of gadids in the Pacific Arctic and advances our understanding of the habitats occupied by these key forage species during their first few months of life. The online version of this article ( https://doi.org/10.1007/s00300-019-02494-4) contains supplementary material, which is available to authorized users. This study was supported by a grant from the North Pacific Research Board (Project #1508) and was also funded in part by the Bureau of Ocean and Energy Management (BOEM) Award # M12AC00009 and in part with qualified outer continental shelf oil and gas revenues by the Coastal Impact Assistance Program, U.S. Fish and Wildlife Service, U.S. Department of the Interior (Contracts #s: 10-CIAP-010; F12AF00188). This paper is EcoFOCI Contribution No. EcoFOCI-N911. The authors wish to thank the scientists and volunteers that collected data on the AFSC, RUSALCA, and Arctic Eis surveys. We would also like to thank Benjamin Laurel, Alison Deary, and 2 independent reviewers for their helpful comments on this manuscript. The findings and conclusions in this paper are those of the authors and do not necessarily represent the views of the National Marine Fisheries Service. Mention of trade names does not imply endorsement by NOAA or any of its subagencies.